A year ago, my school decided that it would be a great idea to have all teachers, and eventually all students, trained in the Tom Rath StrengthFinders assessment. At first, I was hesitant. We did StrengthFinders as part of RA training in college, and I just didn’t connect with my strengths. Looking back, it might have been because we had an absurd amount of WOO on our staff, and as an introvert, I felt highly overpowered and frustrated by them (this brings up a great point, it is important to make sure a staff is balanced based on strengths or whatever other personal assessment tool is used). Slowly, I warmed up to the idea, and signed up for the 2-day workshop. Let me say, I was blown away. Adrian Ruiz was our trainer, and he was an excellent guide and facilitator as we unpacked our strengths, and discussed how they can be beneficial to (balconies) or hinder our work (basements). Adrian is from an organization called the Youth Development Network, based in Sacramento, CA, which does primarily youth trainings around strengths education. We were so lucky to have Adrian work with us, and I hope we can get him back down to San Diego for additional trainings. On top of a great training, I also got to know many of my colleagues better, and I’m finding I’m having more intentional conversations with these people, beyond the usual “hey how are you!” we call down the hall. In fact, this focus on strengths and making meaningful connections inspired me to start FlyHighFri, which has turned into a hashtag on Twitter and newly a blog in conjunction with Justin Birckbichler. 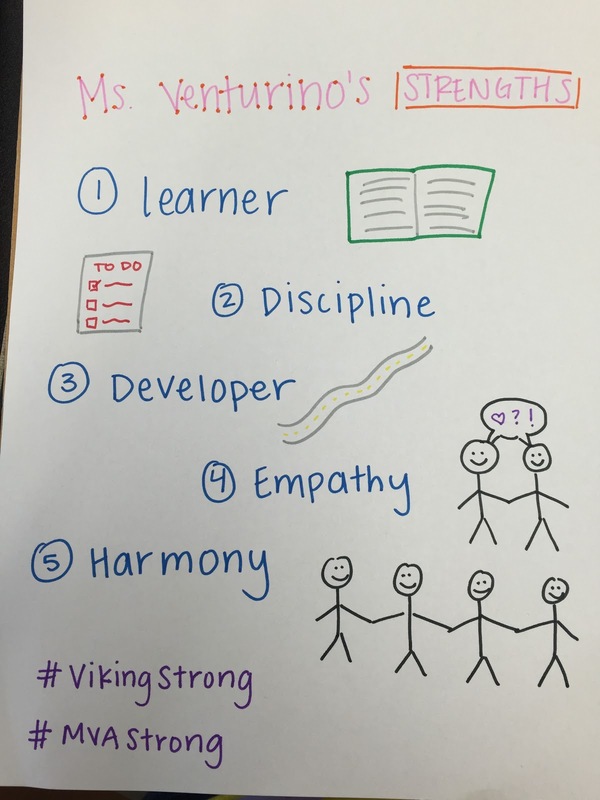 Since the training last March, I have been thinking about how to better implement strengths into my classroom. We did a school-wide Strengths Day in August, and it was both empowering and refreshing to spend an entire day talking about strength. There were different activities for each period: for example, all students made their strength lanyard in period 1 (pictured top right), and their strengths road-map in period 3 (pictured top left). 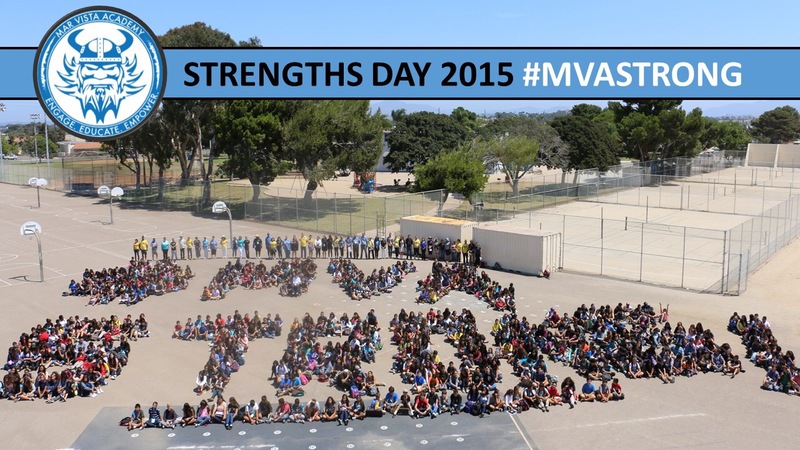 During 4th period, we took a school picture that spelled out #MVAstrong (right). I was so impressed at the cooperation from all students and staff to make this happen! 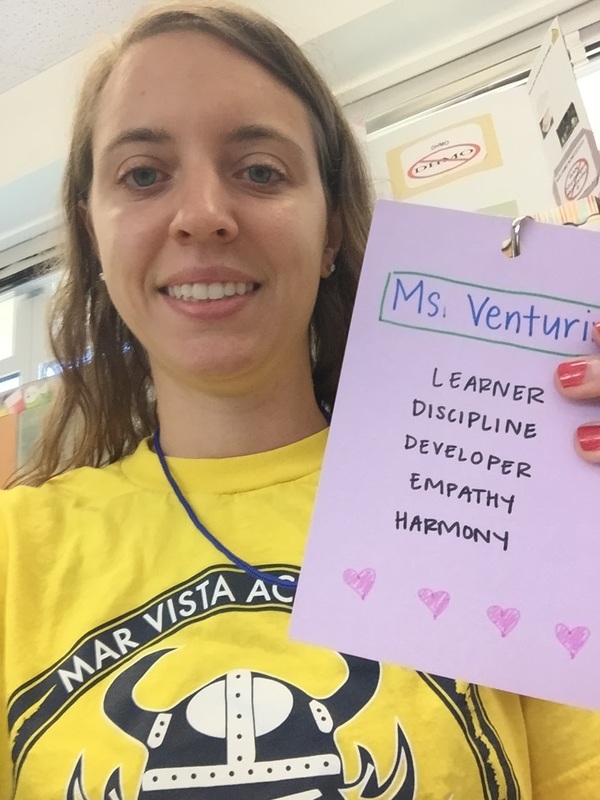 The buzz in the air during and after the photo was electrifying, and felt amazing to be a teacher at Mar Vista Academy. Since our Strengths Day, I honestly haven’t been doing enough with strengths in my classroom. I bring it up occasionally, and I am constantly reminded when I see my lanyard hanging off my whiteboard or the small section of upper cabinet I decorated with the brief explanations of each strength. My AVID class is the perfect place to have ongoing strengths discussions, and I have been doing my students a disservice by not bringing it up often enough. Perhaps I’ll do at least one short activity each week, even if it’s just a warm-up. It’s times like this that I wish I taught elementary, so I could have students’ desks or pencil boxes labeled with their name and their strengths. Or I need some augmented reality (Google Glass?) where their strengths hover over their heads. Lately I’ve buried in work and strengths were getting pushed to the back burner. I’m officially bringing it up on the priority list to make sure all strengths are supported and encouraged in my classroom. I’d love any suggestions you all have to better integrate strengths into my classroom, send them my way! I’ll leave you with this goofy video of staff musical chairs. Obviously, physical strength is not one of my strengths. School assembly, staff musical chairs.